Hotel Transylvania is still playing in theaters nationwide, and with Halloween approaching, director Genndy Tartakovsky has a special treat for the fans. Regal Cinemas is debuting the filmmaker's new animated short Goodnight, Mr. Foot before all Hotel Transylvania screenings starting Friday, October 26. Take a look at the first three photos from the short, then read all the official details in the press release. Hotel Transylvania - the record-setting 3D computer-animated monster comedy from Sony Pictures Animation that ranked as the biggest September opening in movie history and the best opening ever for the studio - is releasing a new animated short as a special Halloween treat. Entitled Goodnight, Mr. 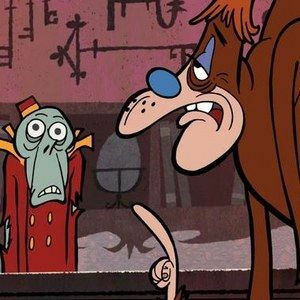 Foot, the short stars none other than the legendary monster Bigfoot, and follows his adventure as he, too, checks in to Dracula's five-stake resort in search of a little R-and-R, only to find himself faced with an enthusiastic witch-maid, eager to make Mr. Foot's stay a memorable one. Here's what Genndy Tartakovsky had to say. "After we finished Hotel Transylvania I got an itch to animate! Taking inspiration from my favorite directors Bob Clampett, Tex Avery, and Chuck Jones I animated a short cartoon in the traditional 2D style. It was difficult and exhilarating all at once and I hope people will enjoy it as much as I enjoyed making it." To commemorate the debut of the animated short, an exclusive new collectible one-sheet-designed by Tartakovsky himself-will also be given away at all showings of Hotel Transylvania in Carmike Cinemas nationwide from October 26 (while supplies last). The new traditionally animated short film, exclusive poster and online video make a new (or return!) visit to Hotel Transylvania which critics called "a treat for the kids as Halloween draws near" (Chris Knight, National Post), as well as the perfect family outing for Halloween 2012-"a total scream for boys and ghouls of all ages" (Jeff Craig, Sixty Second Preview)! Columbia Pictures presents a Sony Pictures Animation film, Hotel Transylvania. The film features the voices of Adam Sandler, Andy Samberg, Selena Gomez, Kevin James, Fran Drescher, Steve Buscemi, Molly Shannon, David Spade, and Cee-Lo. Directed by Genndy Tartakovsky. Produced by Michelle Murdocca. Screenplay by Peter Baynham and Robert Smigel. Story by Todd Durham and Dan Hageman & Kevin Hageman. Executive producers are Adam Sandler, Robert Smigel and Allen Covert. Music by Mark Mothersbaugh. Music Supervision by Liza Richardson. Imagery and Animation by Sony Pictures Imageworks Inc.